We are on the road making Ecuador comparisons, weathering the weather and wishing for Ecuador weather. In other words Merri and I have extended our Florida meanderings so we do not arrive back at our North Carolina farm in a snow storm. 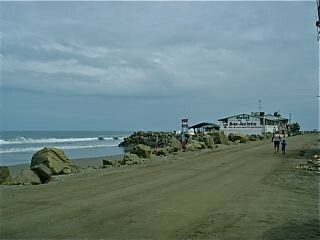 We have been looking at Ecuador income potential and so let’s view this hotel for sale on Ecuador’s beach. Ecuador weather looked pretty grey on the day I took these shots… but we never have to worry about snow! Readers often write asking about the weather in the Andes. If you look up Quito weather for example it says “Rain” almost every day. This is a puzzle as it is not true. 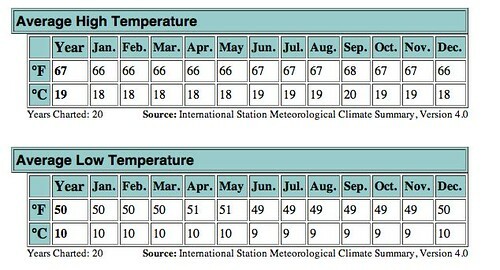 Here is a great history of Quito weather from the Washington Post at http://www.washingtonpost.com/wp-srv/weather/longterm/historical/data/quito_ecuador.htm. Here are the average temps. We have been traveling though Florida getting a feel… wondering what has led us here. Innocently wandering around… looking… checking…. waiting. Of course the weather is great… though a bit sticky at times…. plus too dry right now. This is Florida’s third worst drought in history. 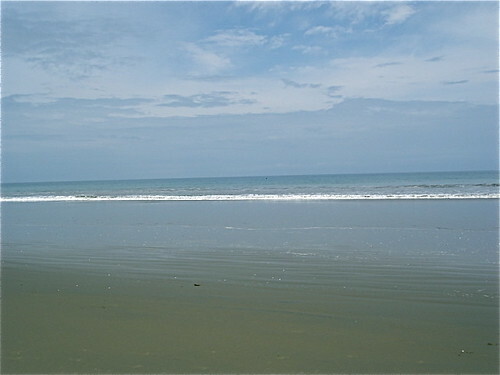 We can’t help but make comparisons with Ecuador. First, when hotels here quote room rates…. they do not let you know of the tax. In Ecuador we always provide this warning so guests know what the entire cost will be. Secondly, hotels do not seem to have noticed the economic downturn. Prices seem pretty high $119 for a Holiday Inn express and $129 for a Holiday Inn… plus the unmentioned taxes… for the typical box.This is double what our hotel costs at $59 (plus 22% tax). Third, comes the free breakfast… overcooked buffets… terrible bakery pastries and everything served on foam plates and cups… with plastic knives and forks… without much (or really any service)… including the “wonderful” Smuckers jam. I think of our hotel’s great cooked when you arrive, full breakfast… juice….fresh fruit made into an art form… hand made butter and hand made marmalade… plus choice of eggs in numerous ways… bacon or ham. Though I have to be honest, I do not like the bread our hotel serves… next thing on my list to fix. 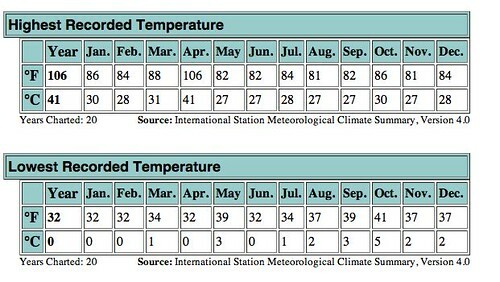 This is not a complaint… just a comparison. Remember we are looking to buy in Florida because we also love it here. Merri and are having a great time. We are enjoying Florida’s warmth… seeing a lot of territory… ranging from Naples to Lakeland… Winter Haven… up to Clermont…. Mt Dora… Tavares… Leesburg… Deland… St Augustine… Palakta… Zeypher Hills plus some really out of the way (our favorite) places like Ridge Manor… Crows Bluff… Lady Lake… Fruitland Park. This note is written from outside of Gainesville and today we inspect the Suwanee River. The best place we have seen so far was remote… on the Withlacoochee River. We would have purchased this on the spot… except… it should be renamed… Withlacoochee Puddle! We were very sad to see numerous lakes and rivers that are pretty much gone… during the terrible drought we are seeing here. This reminds me of an important multi currency fact. The global economic downturn has driven the price of many shares down.. but has not stopped basic essential needs… like our need for water. Shares of companies denominated in strong currencies that provide excellent needs can offer special value. Take the water share we have followed for years… Hyflux. Hyflux Ltd is company listed on the Singapore Stock Exchange that has a proprietary water filtering system that does business in China, India, the Middle East and North Africa (MENA) region as well as Singapore and Southeast Asia. I’ll be sending a full report on the Hyflux shares to my Multi Currency subscribers shortly. You can enroll and study this report here. 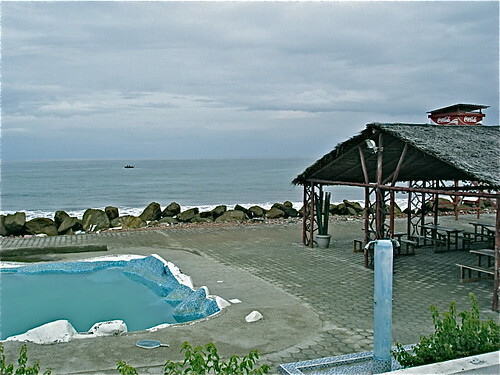 Back to the Ecuador beach hotel for sale. 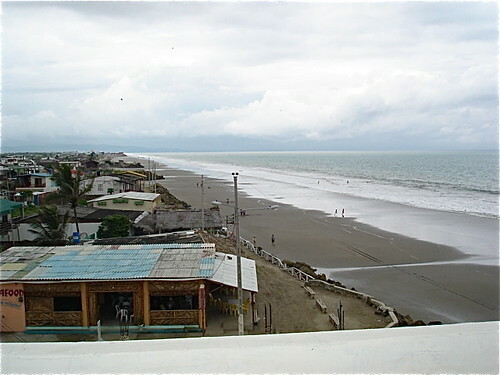 the area where the hotel is located. Though this day was grey… there is a reward that comes with the clouds. 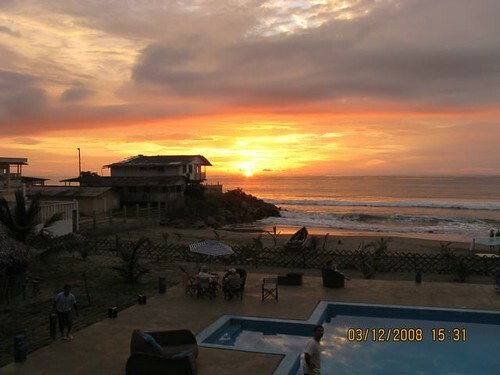 The moisture creates some spectacular sunsets… like this one shot a bit north of this hotel at Palmazul. We viewed this hotel on a recent real estate tour and I am sending a full report to my Ecuador Living subscribers next week. If you are not a subscriber and would like this report, you can learn how to subscribe to Ecuador Living here. 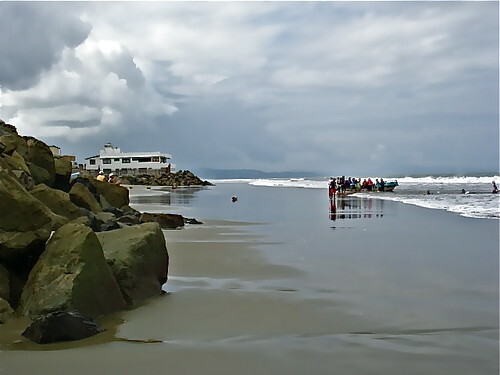 Delegates stay on this beach on our Ecuador mid coastal real estate tour.